In addition to being a mom, writer, and explorer, Elizabeth is also an attorney who works with small businesses. She helps entrepreneurs, artists, coaches, and consultants find simplicity in the law, so they can get back to spending time helping their clients and changing the world. Elizabeth didn’t start out with the goal of being an attorney, in fact early on it was the self-proclaimed science nerd who was winning the career race, with a triple major in chemistry, biology, and environmental studies. Clearly, she was on science career trajectory until she spent 10 weeks working one particular project. The project lasted an entire summer and at the end, the results were inconclusive. That was when she realized she hated spending so much time working on something only to discover that the work essentially didn’t matter. Elizabeth realized that science wasn’t going to work out so she began looking at other potential careers which is how she eventually found herself in law school. One of the first things Elizabeth and I discussed is her website name. Instead of using the name of her law firm, EPW Law, she uses her own name. Since this is a question I’m asked often, I decided to find out why she chose her name over her business name for her website. Elizabeth suggests there is one very practical method to determine which name you should use. If you have a common name, such as Jennifer Smith (sorry Jennifer), odds are good that your name is already taken. If this is the case for you, you’ll need to find something else which could be a brand or the name of your business. In Elizabeth's case, she uses her married name in her domain because it affords her a uniqueness. Meaning, no one else shares that name. You could achieve the same by adding your maiden name, your middle name, your middle initial, etc. Elizabeth also suggests that the name you choose is really more strategic than you might think as it may be possible for you to trademark your name. Strategically, using elizabethpottsweinstein.com allows her to change the name of her website to a business name in the future if she wants to. Had she gone with her business name initially, then later decided to change the business name, she would essentially be starting over. Using her own name allows her to change her business name without losing any branding associated with her name. Since Elizabeth is the first attorney I’ve had on the show, I admittedly wanted to take advantage of her knowledge as it applies to our websites. So my first few questions for Elizabeth were about the required documents you need for your website. Specifically, I asked her about the following. So we're clear, she's not referring to the cookie monster kind of cookies. Not sure if you capture cookies? Elizabeth tells us if you use Google Analytics, then you are collecting cookies from your visitors. The good news is, for most of us, the policy does not need to be overly complicated. If you have questions, please consult with an attorney. Both of these legal documents come into play if you are using your website to make money, whether you are making money for your services or selling products. You may also need to add terms or affiliate disclosures if you engage in the following activities. If you struggle with this concept, look at it this way. If are given anything of value in exchange for a review, you are in effect being paid for your service. I asked Elizabeth about the placement of disclaimers, specifically as they relate to affiliate links. The best practice, the one desired by the FTC, is to have the disclaimer right next to the link. This allows the person clicking on the link to be “pre-warned”. In other words, they know what they are clicking on. We also discussed the proper placement of these legal disclosures, if they can be combined and whether or not you need them on every page of your site. 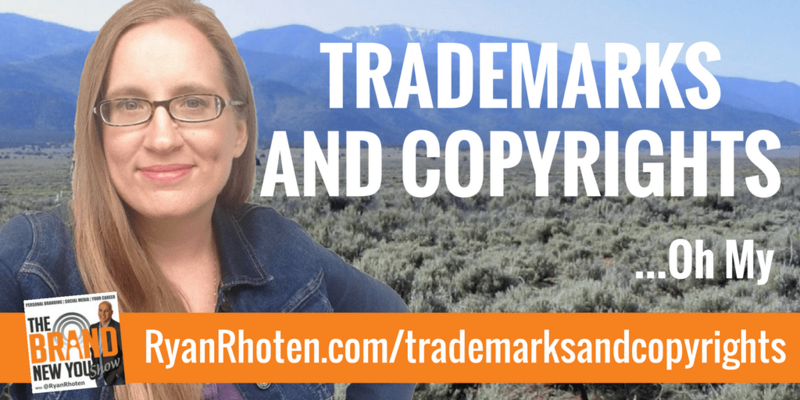 TRADEMARKS, PATENTS, AND COPYRIGHTS…OH MY! Having recently written a book (Affiliate link. I will receive a small commission if you buy from this link), the topic of trademarks was something I contemplated often. Specifically around the name of the book. Elizabeth tells us there are two versions of trademarks. The typical trademark is what you are most used to seeing. They provide some protection to their owners. Trademarks are usually associated with the source of a particular product or service. They can be applied to one or more of the following “buckets”. While trademarks are associated with the source of a product or service, they were originally created to protect us as consumers. They give us the confidence to know that what we are purchasing is the genuine article and not a fake. A registered trademark is a much bigger deal. It provides you with protection across the entire United States as opposed to only the states in which you sell your product or service. They must also be registered with the United States Patent and Trademark Office (USPTO). Copyrights are the rights that you have over any creative work you produce that has been reduced to a “tangible format”. This includes electronic mediums such as this blog post. Essentially, as soon as you have developed and released into the world anything creative, there are automatic copyrights attached to it. You can apply for an “official” copyright with the USPTO as well. Like trademarks, it can take time to process the copyright, however, once granted you have the right to sue should someone infringe on your copyright. I ran across Elizabeth after reading her blog post titled “5 cheap ways to protect your trademarks and copyrights”. We close out today’s session discussing the ways from her blog post. What follows is a brief description of each one. For a complete list of all items check out her post. We discussed this one earlier. Head back to the top of this post or over to Elizabeth’s website for more details. This method is akin to calling “dibs” on something before anyone else. If you own the domain it will cause others to select something else. Before you purchase a domain, do a quick google search to see if it shows up. It’s possible someone has a trademark on the term but hasn’t yet purchased the domain. Elizabeth tells us that the copyright symbol can be placed on anything that is your creative work and is in a tangible format. While not necessary you can do it. Other things to consider are placing watermarks your pictures. Elizabeth also cautions using images you find on the internet for your blog posts. In most cases, they will be copyrighted and you could be liable for using them. Look for images with creative commons licenses. I personally use StockSnap.io. All images are free of copyright restrictions. A trade secret is a secret process conducted inside your business. No one, except you, knows how it works. Essentially, you keep it secret and only reveal it under a Non-Disclosure Agreement. Everyone has some type of trade secret in their business, the most common form would be your client list. If your trademark becomes a verb it’s possible you can lose your trademark. You need to make sure your trademark is used only as intended. Safeguard it so it doesn’t become something people recognize as a generic action or verb. Examples include Pilates, which is not trademarked. For more information, check out Elizabeth’s blog. Elizabeth specializes in working with small businesses. She helps start-up plans, online website advice, trademarks, copyrights and a variety of “legal things” small businesses might need assistance with. She works on a flat fee for bigger projects and will conduct a quick call with you for fifteen minutes at one-hundred dollars if you need a couple of very focused questions answered.